I love the boys over at Climate-Resistance.org because they’re big-picture thinkers. Their analysis emphasizes the ethical, philosophical, and political aspects of the climate discussion. This week they’ve been saying that replacing Rajendra Pachauri as chairman of the Intergovernmental Panel on Climate Change (IPCC) won’t solve our problems. Personally, I think he needs to go. But it’s true we’d be having a totally different discussion had numerous parties not failed us. You have to be a bit of a drama queen to interpret a few degrees increase in temperature over the span of a century as a catastrophe. The fact that this mindset has been adopted by so many people means the failure has been systemic. The United Nations, the wicked stepmother of this sad story. The IPCC is a United Nations creation. But it has no conflict-of-interest guidelines. It has no checks-and-balances to prevent its hijacking by special interests. It is also exempt from the sort of Freedom of Information provisions now commonplace in democratic nations. In other words, it lacks accountability and is structurally a disaster. The Nobel Peace Prize committee, which devalued its most precious resource. The Nobel committee bestowed its seal of approval jointly on the IPCC and Al Gore – even though there are significant discrepancies between what the IPCC says will happen and what Al Gore’s film, An Inconvenient Truth, dramatically implies. Now that the government of India has established its own climate body, and the government of the Netherlands says the IPCC got basic facts wrong (regarding the percentage of its country that falls below sea level), the Nobel prize has never seemed more tarnished. NASA, supposedly a purveyor of scientifically-sound info. Until late January of this year, NASA parroted on its website the absurd IPCC claim that Himalayan glaciers would disappear by the 2030s. According to Jeffrey Kargel, at the University of Arizona, this statement “was just so wrong it wasn’t worth discussing.” Surely the question needs to be asked: if NASA is clueless about such matters, why should we pay attention to anything it says about climate change going forward? The science academies of more than a dozen of the world’s best-educated nations. Reputable organizations such as the US National Academy of Sciences and the Royal Society of the UK have endorsed the IPCC’s climate analysis. 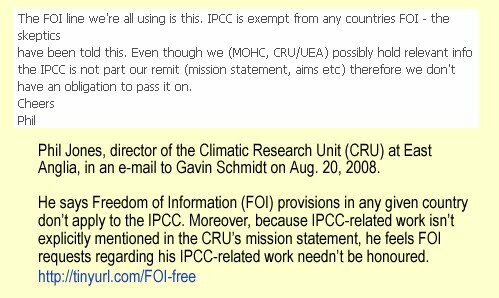 This joint 2008 statement cites the IPCC as though it were the purveyor of gospel. Did it not occur to these folks that third-party verification of IPCC findings should be undertaken before they, too, declared that the entire world needed to “transition to a low carbon society”? Drug trial results are closely scrutinized. Corporate financial statements are routinely audited. Yet science academy bureaucrats told us to blindly trust IPCC reports. The mainstream media, who’ve become a cheerleading squad. It’s the media’s job to hold governments accountable, to shine light on special interests and snake-oil salesmen, to promote informed discussion about vital issues of the day. Instead, journalists fell for some of the lamest lines imaginable: the “science is settled” and the “debate is over.” Rather than providing their readers, viewers, and listeners with the opportunity to make up their own minds (in a democracy, voters get to decide for themselves, remember? ), journalists gushed over Al Gore’s eco crusade and ignored skeptics. This is called betraying the public trust. Environmental groups, who’ve morphed into big business. Green activists say they’re saving the world. They’re also empire building. As Climate-Resistance points out, between 2003 and 2008 the World Wildlife Fund raised $3.1 billion dollars. Similarly, Greenpeace raised $2.4 billion over a 12-year period. To keep that kind of money flowing into their coffers, might some people be willing to exaggerate environmental threats? Politicians from top to bottom, from one end of the spectrum to the other. Wrapping oneself in a green cloak is easy. But solving tough problems in the real world is what they’re elected to do. In Toronto, where I live, public transit faces dramatic funding cuts and there isn’t enough money to keep school swimming pools open. But ads in my community newspaper tell me that grants “of up to $25,000 are available” to environmental groups for projects that “reduce emissions… and help us adapt to climate change.” The more I examine governments around the developed world, the more I find this pattern. Ordinary folks like you and me. Yes, many of us have busy lives. We’re focused on getting our families through the week, and through the school year. Some of us are coping with illness and injury. We don’t have endless hours to untangle complicated political questions. But before we make up our minds about a matter as important as climate change, should we not spend some time listening to more than one side of the story? We wouldn’t convict someone of a crime without giving them an opportunity to defend themselves. We shouldn’t convict carbon dioxide emissions of triggering all manner of disaster before we’ve considered the opinion of one or two people who think this theory is nonsense. We’ve all contributed to this train wreck. Now we need to stare down the drama queens and start behaving like grownups. This entry was posted on February 6, 2010 by Donna Laframboise in Al Gore, Greenpeace, IPCC, NGOs, Rajendra Pachauri, World Wildlife Fund and tagged Climate-Resistance.org, Intergovernmental Panel on Climate Change, IPCC, NASA, Nobel Peace Prize, Rajendra Pachauri, Royal Society - UK, United Nations, US National Academy of Sciences.